India General Knowledge Question Paper No. 204 Solved: India General Knowledge (GK) Sample Question Paper with Collection of 10 Question Q.No. 3131 to Q. 3040 of India GK Questions based on Nabard Assistant Manager Grade A-B Exam Paper 2015. You can Download and Check Over 200+ Fully Solved Paper on INDIA GK MOBILE App. 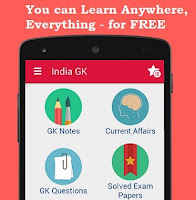 India GK Mobile app offers complete question paper with Multiple Choice Questions (MCQs) for all 100 Questions asked in examination for free download and take a test on Mobile app. India GK website and Mobile app offers Current affairs News, Multiple Choice Questions (MCQs) available on Website www.IndiaGK.net and Android Apps with daily updates. What is the minimum paid-up equity capital required for starting a small finance bank? The ‘digital village’ project to provide services ranging from cashless banking was recently started at Akodara village of Gujarat at the initiative of? The year 2015 has been declared by the 68th Session of United Nations General Assembly as? Union Government renamed Direct Benefit Transfer Scheme for LPG as? At the Asian Games held in September-October refused to accept the bronze medal in order to protest a controversial decision by the judges? As per Union Budget how much capital is required to be infused in banks to meet Basel-III norms by 2018? Banks borrow money from the RBI at which of the following rates? Banks will soon be able to offer higher rate of interest on unbreakable fixed deposits What is the minimum amount that is required to be invested in such a deposit scheme? How many applications have been received by RBI for starting payments bank?